Manitowoc Ice is America’s number one selling brand of ice machines for a reason – energy efficiency, reliability, and a service and support network that is second to none. Choose from Modular, Remote Air-Cooled and Undercounter/Water Cooled. Manitowoc Ice’s CVD Remote condensing unit for S-Series and QuietCube ice machines. Vertical discharge remote condenser for Multiplex chillers. It’s your call. With HurriChill™ you are free to choose from one of the most extensive lines of blast chillers and shock freezers on the market – with models that can process from 30 to 1500 pounds of food per cycle. Experience matters. American Panel has an experienced engineering team at your service that has complete knowledge of the entire HurriChill™ line. Count on their team to work with you in creating the best solution for your specific application. Rely on American Panel. An industry leader in customer service, American Panel’s fully trained technicians are able to service your needs throughout North America. Their engineers are available for on site installation supervision and training. A comprehensive inventory of parts is also available for immediate shipment should the need arise. Always remember. You can count on enjoying the highest possible level of customer satisfaction with the American Panel – HurriChill™ lines of blast chillers and shock freezers. Turbo Air is dedicated to the manufacture of high quality refrigeration equipment. With superior workmanship and materials, you can rely on the performance of Turbo Air. For over 65 years, True has been an industry leader in commercial refrigeration and continues to exceed customer’s expectations through high standards in customer service, quality materials, design, availability and performance. For over 65 years Victory has been a leading manufacturer of commercial foodservice refrigeration products, focused on providing customers with unsurpassed value, superior customer service and the highest quality products available in the industry today. A continuous product development process ensures a steady stream of innovative, technologically advanced designs; which provide the ultimate in energy efficiency, food safety, storage flexibility, reliability and durability. Each Victory model is designed with essential standard features, while also offering a wide variety of options, accessories and modifications. 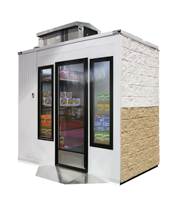 ICS offers a one-piece walk-in freezer or cooler designed for both outdoor use and indoor use. This type of outdoor storage has fulfilled a need of the foodservice industry by providing a solution that helps reduce high construction costs normally associated with new or remodeled construction projects. The overall footprint of the building is reduced by placing the walk-in freezer or cooler on the outside of the structure, realizing a net savings in construction time, labor, materials, and overall spending. ICS has numerous foodservice chain partners who, for years, have utilized the ICS one-piece design for their walk-in needs.